By placing the pads exactly at the site of the pain, you get fast relief, without having to digest potentially harmful or addictive prescription medicine. TEC.BEAN Tens therapy has FDA, CE,ROHS certification, which is considered free of side effects, so it's safe to use it whenever you need! The sensation of massage is very real. You'll wonder who is administering your massage -but it's just the device! It penetrates muscle group deeper than human hands can. When you place electrode pads in the pain points, you will feel instant relaxation and pain relief. 20 level of strength adjustable by increasing or decreasing steadily. Increase "+" button from level 1 through level 20. Multi preprogrammed massage modes, 10 levels of strength adjustable by increasing or decreasing steadily. People with back pain, arthritic or inflamed discs/ joints, shoulder tension and many more injuries and disabilities would benefit from the units relaxation and release of tension. Pocket size, portable and convenient:relax any time! Anywhere! Total body relaxation: use for back, knee, shoulder, ankles, wrist and elbow and make this the most powerful weapon in your fight against chronic pain. Please use right usb cable and do not use this item while it's charging.this item needs to be put it in state of "on" when charging it. 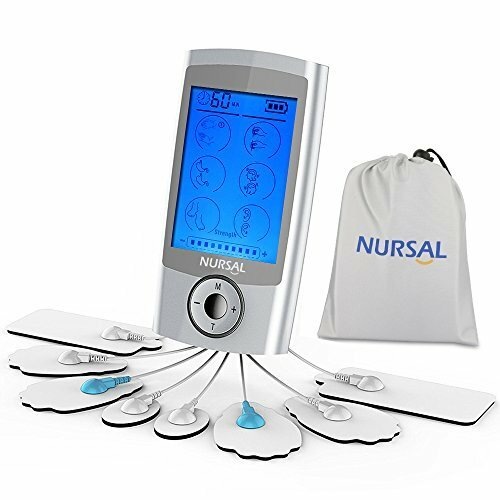 Simultaneous dual output design, 8 pcs of self adhesive conductive reusable pads , replaceable self-adhesive conductive gel pads, not necessary to use any cream and gel together,allows 6 pads to be applied to the two different targeted areas at the same time.Extra bonus: free 2 large pads. Easily adjustable settings,animated display on LCD screen: massage mode, intensity, treatment time. Built in timer from 10 to 60 minutes,default timer: 20 minutes. When time is due, it is automatically shut off. Built in rechargeable lithium battery-- up to 10 hours of continuous use. It can be connected to wall unit or computer USB port to charge. Don't worries about treatment interruption for dead AA batteries any more. With battery level indicator remind you charge timely.